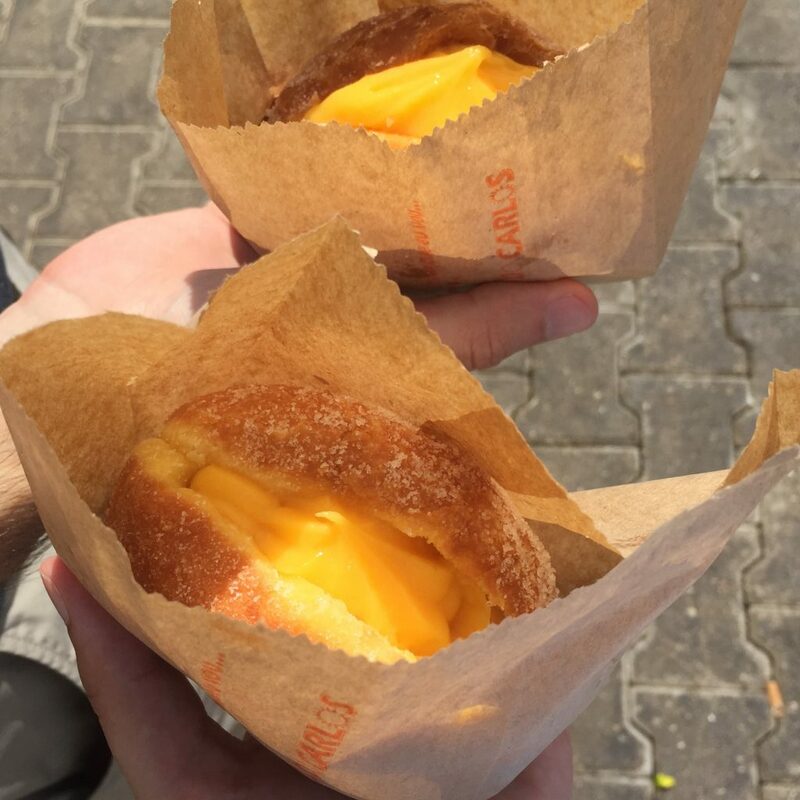 and since the theme of the moment seems to be sweet stuff, i’m going to mention the typical beach snack in portugal too: bolas de berlim! they’re a different species from their german or slovenian counterparts, in that they’re not filled with jam or covered with a thin layer of chocolate. these balls are serious business, cut in half and properly filled with “creme pasteleiro”, a kind of thick egg cream. 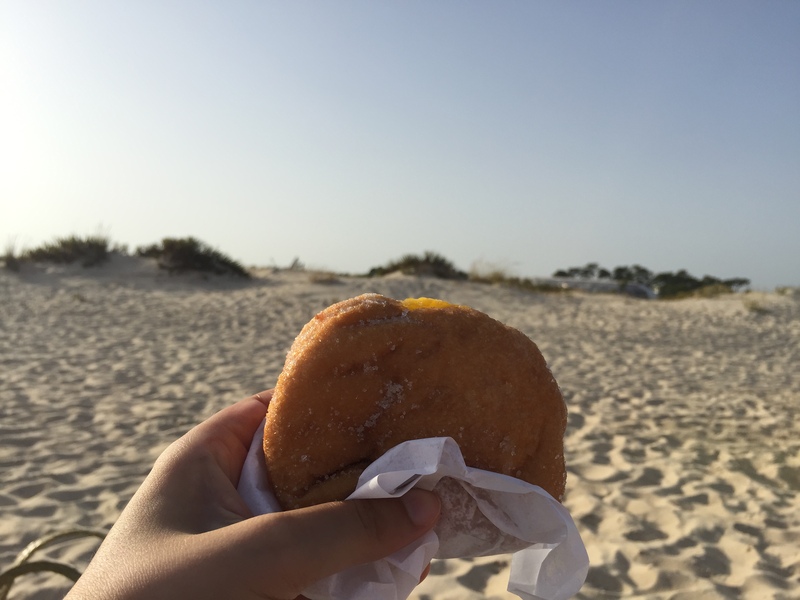 as a rule, they’re outstanding everywhere in portugal, but somehow they seem to taste better at the beach… maybe something about all that sea breeze opening one’s appetite? :D men carry them around the beach in styrofoam boxes, shouting out loud “booooooliiiinha!” so that everyone can hear and come to them for their sweet craving. we like them a lot but truth be told, we don’t go to the beach all that often… so when a friend told us they could be purchased straight from the source, we drove to the factory in olhão and got some! i have to say, i was a bit skeptical but they were a-ma-zing! still warm from the frying and filled with the freshest egg cream, not too lemony or otherwise weird — just as i like them. what a treat! sadly, the factory closes over winter, and we’re already counting the days until they’re back in business. see you soon, dear bolinhas! yesterday at a restaurant over lunch, a british lady sitting with a group of friends on the table next to ours asked the waitress for a dessert recommendation, “something typical!“, she said. the waitress pointed to one of the few items on the menu that didn’t have a photo and said “try this — you’re going to like it. if you don’t, you don’t have to pay!“. she laughed and ordered it. 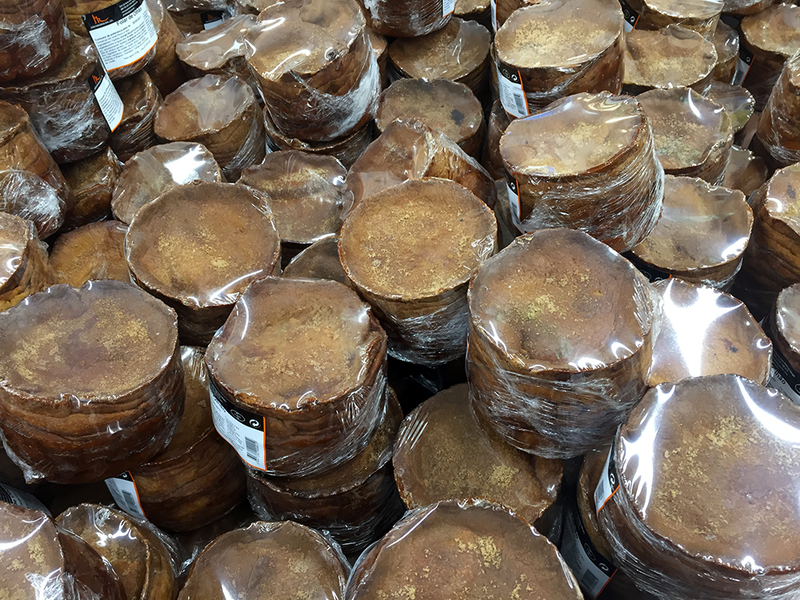 dom rodrigo is a traditional sweet from the south of portugal, consisting of (what else!) egg yolks and sugar, sprinkled with a bit of almond. 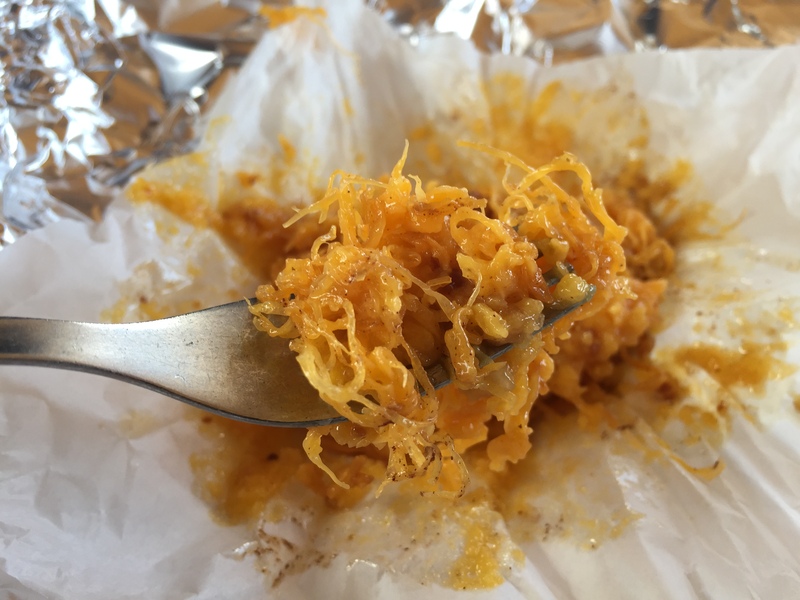 the yolks are turned into angel hair, delicate golden strands drenched in a syrupy concoction of almond and more yolks. it looks like a mess and would probably be a hard sell were it merely scooped onto a plate, but the fanciness of the package gives an almost dignified air to the whole thing. not that it matters how it looks because the taste of it… goodness. 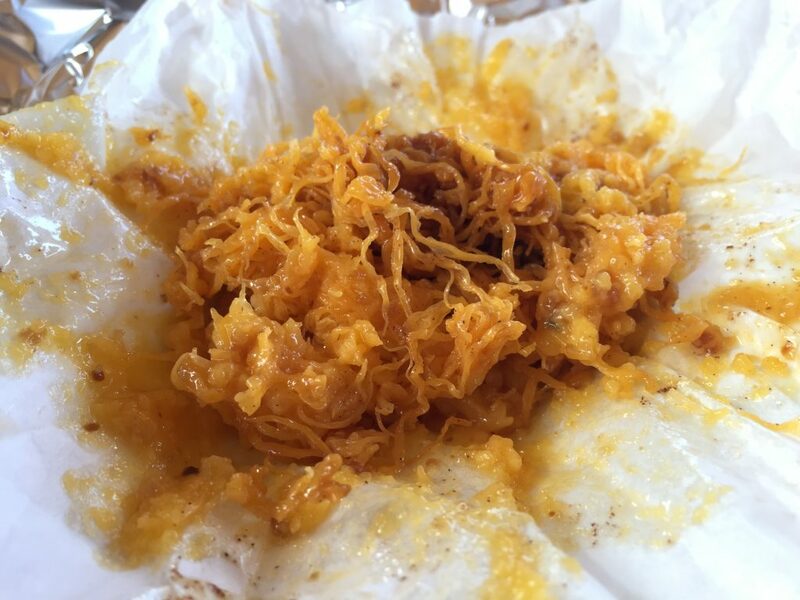 those gooey strands are the thing of dreams! they melt in your mouth and leave nothing behind but sweetness, the faintest hint of cinnamon, and a crave for the next hit. a couple of scoops later and it feels like it’s over before it even started. soon enough you’ll find yourself trying not to lick the paper! 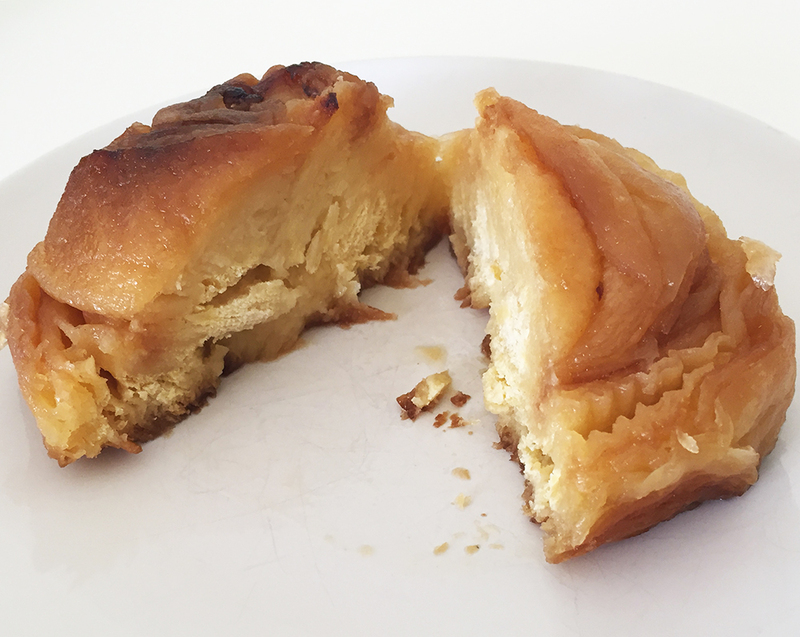 folar is a traditional portuguese easter cake — the equivalent to hot cross buns. 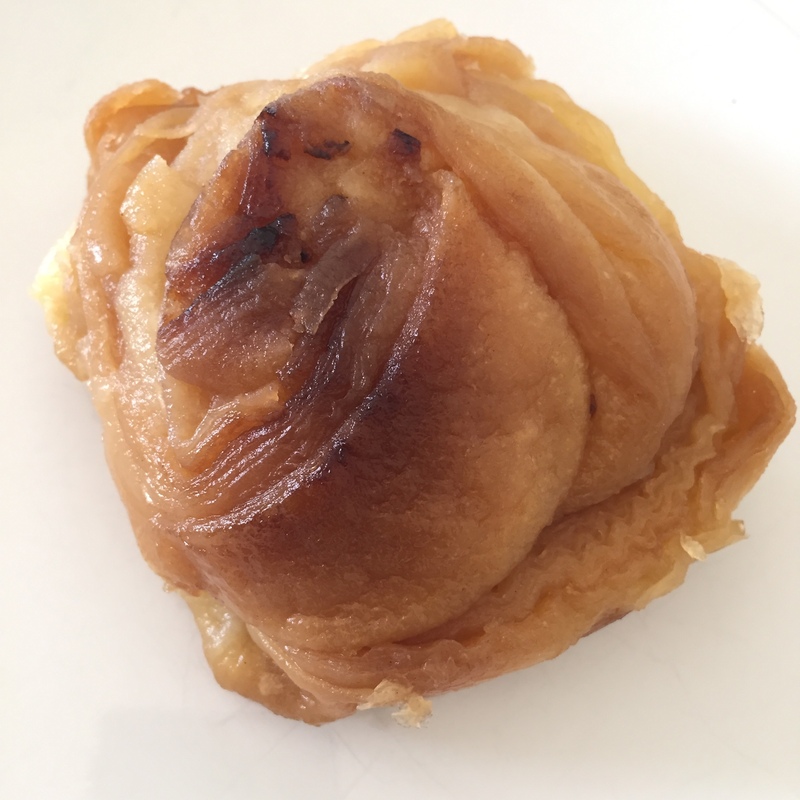 there are several different types of folar here in algarve, but they’re usually a layered cake, cooked in small pots. 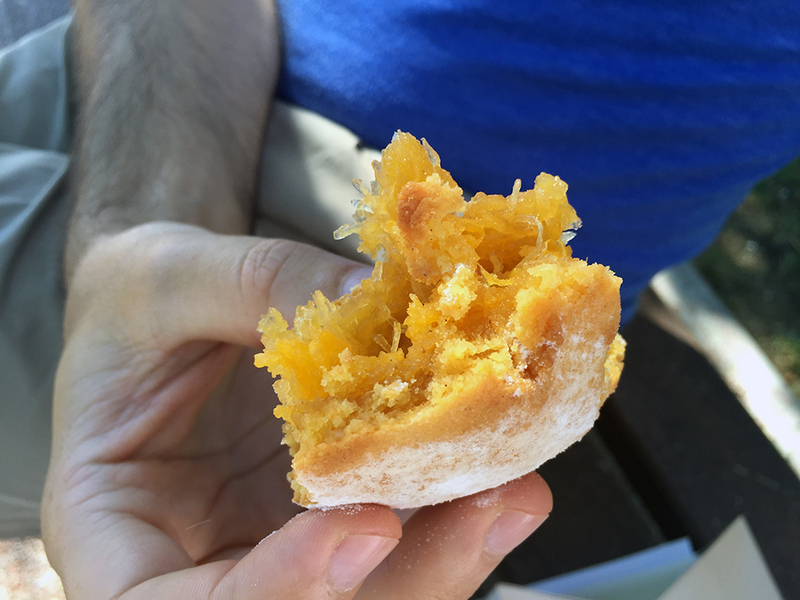 they do a delicious version of it in olhão that is so good they sell it year-round in supermarkets! … magic! 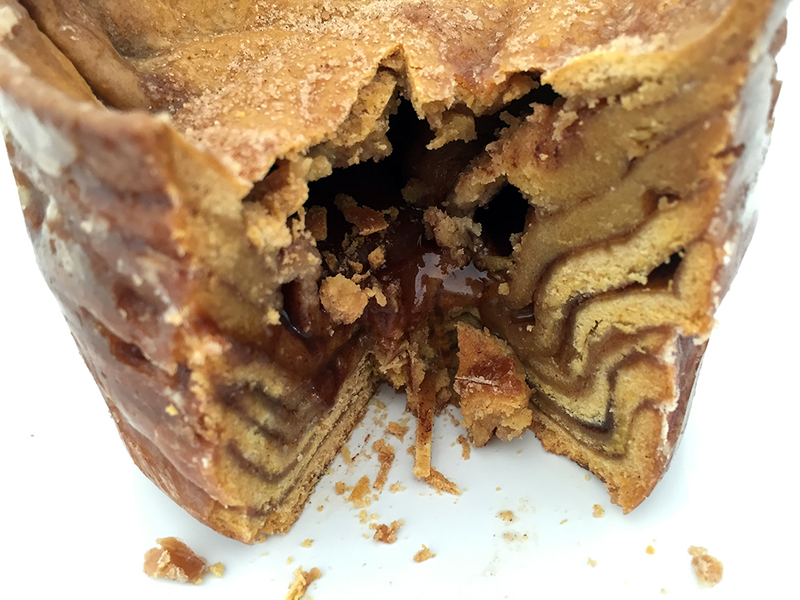 layers over layers of moist cinnamon-y goodness, compacted over time under a thick syrup. it might be ugly, but it’s oh-so-good. don’t knock it until you try it! ps — well, i’ll be damned — looks like we’ve been eating it wrong all along… this explains so much! … magic! :D the little “olives” are made of marzipan and cocoa, and the bread’s filling consists of tons of egg yolks, sugar, almonds and chila (fig-leaf gourd). 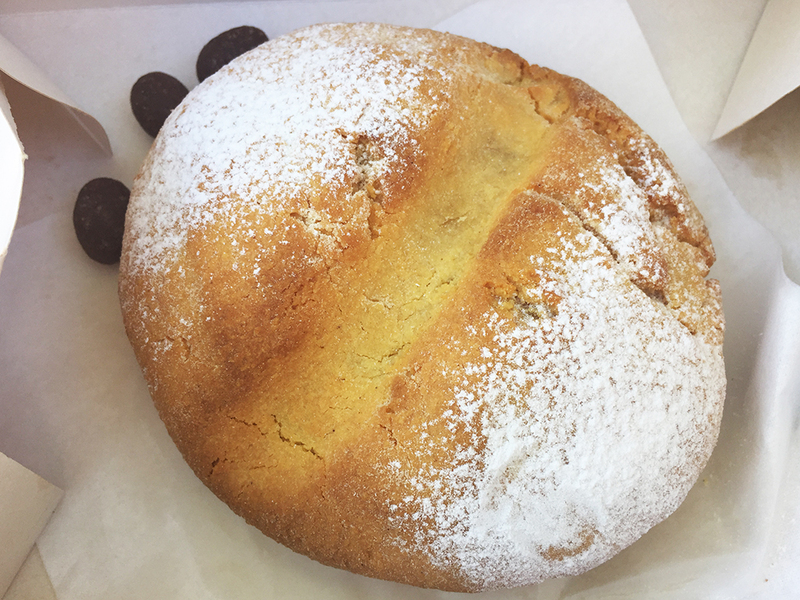 as you would expect, it was a-ma-zing, really delicate and soft… though a bit on the heavy size, as sweets go. ahem. 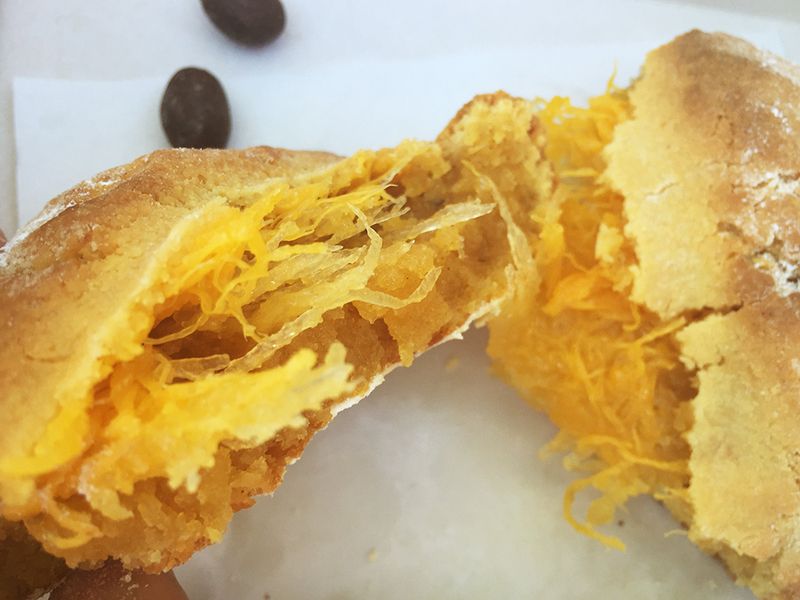 turns out, in our naive enthusiasm, we bought a whole pão de rala, which i suspect was meant to be shared with a group of people. “perhaps a small slice would have been a more sensible portion”, said the boy.